And here it is, my friends! The final Mossflower Collection preview. I have been coaxing this collection into shape for about a month and a half now, and it is wonderful to see the pieces all together. Like a little garden that I am able to enjoy at my leisure. 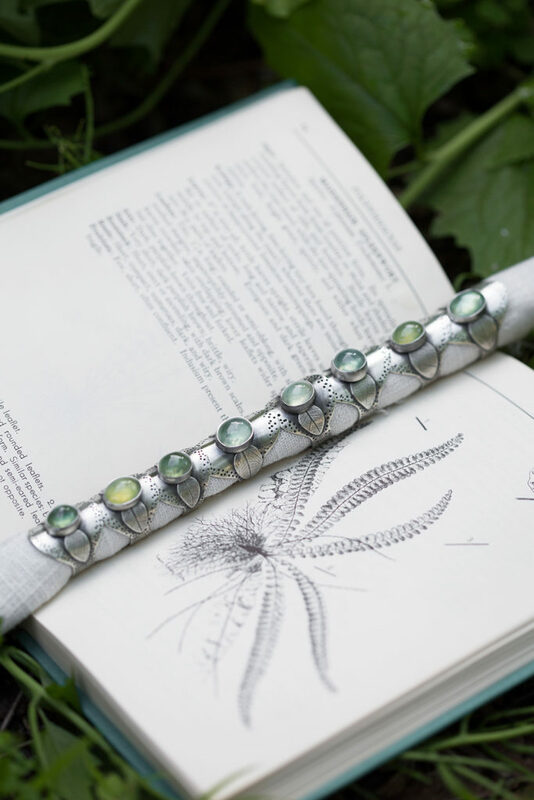 One of the threads that I have trailed throughout this this series (in addition to leaf print and prehnite green) is movement. 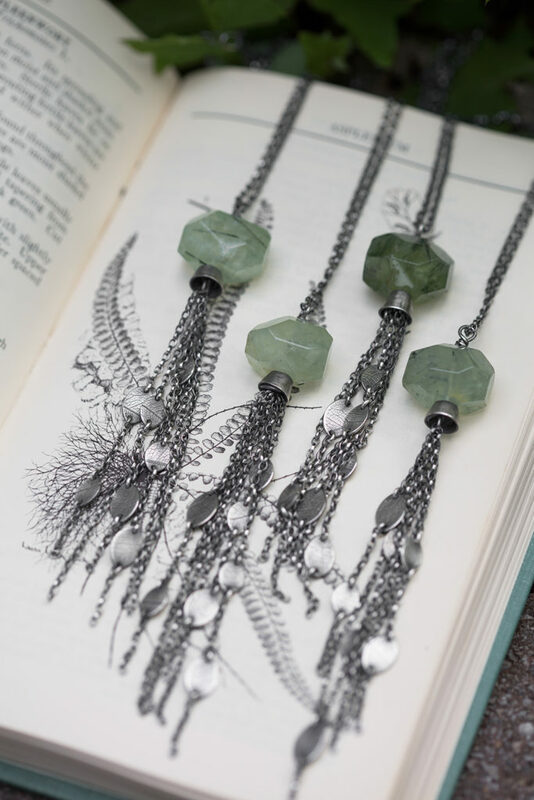 Many of the earrings and necklaces incorporate movement into the design. Some have a lilting sway like a willow bent over a pool, and others have the stiff, structured movement of oak leaves on a gnarled branch fluttering in the wind. 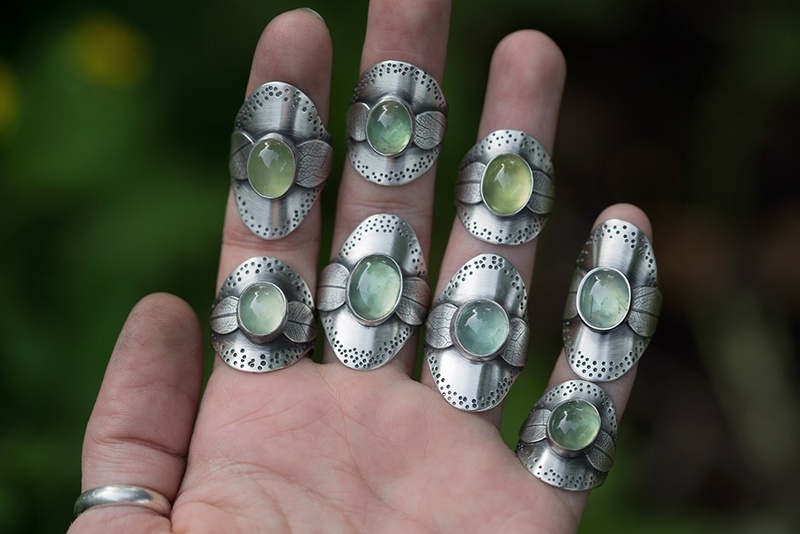 While trying to figure out how to incorporate movement into a set of rings, I filled two or three pages of my sketchbook with fanciful design ideas, but finally settled on this set of simple prehnite rings with a couple of leaves dangling below. 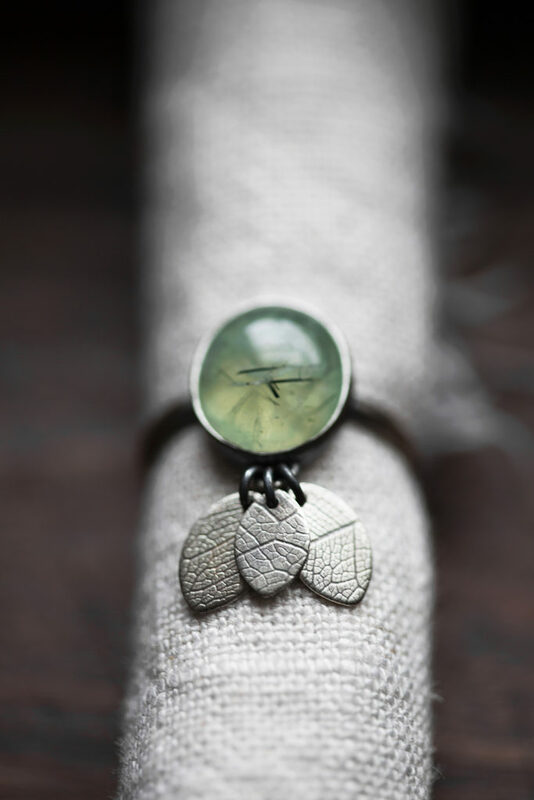 The gentlest flutter of leaves throughout the day. And of course, I needed to make tassle necklaces to pair with the tassle earrings I shared before. 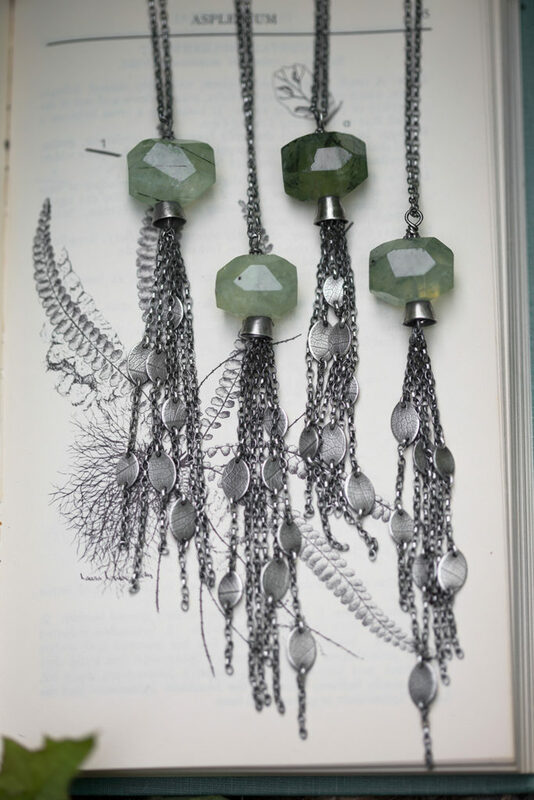 I found the most beautiful prehnite nugget beads with thorny rutiles shooting throughout and an irregular faceting, and I knew they would make perfect, weighty tassle necklaces. 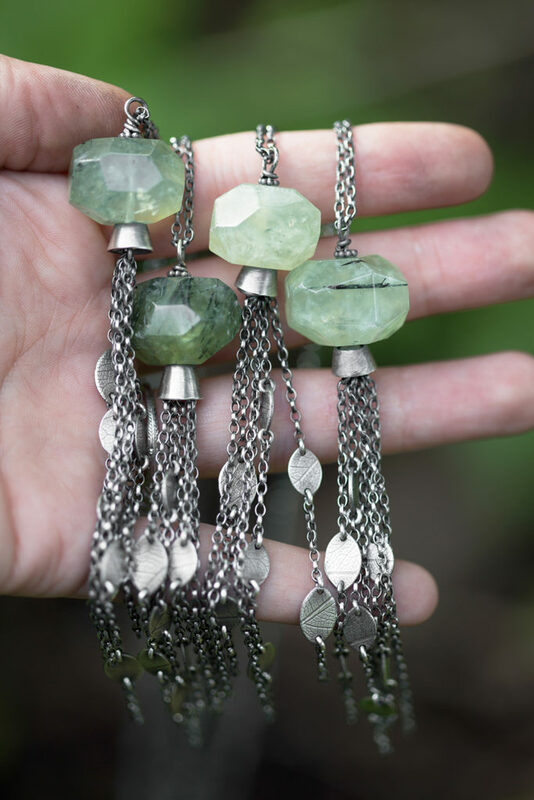 Below the prehnite is a swath of chain with tiny leaves built in. 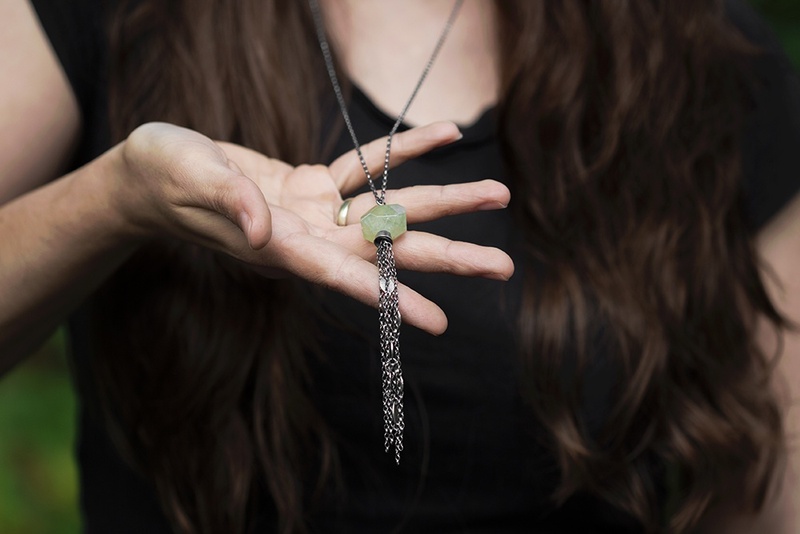 There are four, and they come on adjustable chains in order to accommodate whatever outfit you wear. And with so many requests for these wide band rings with a botanical motif up the side, I knew I had to make a few more. So there will be six of these total in various sizes in the shop update! 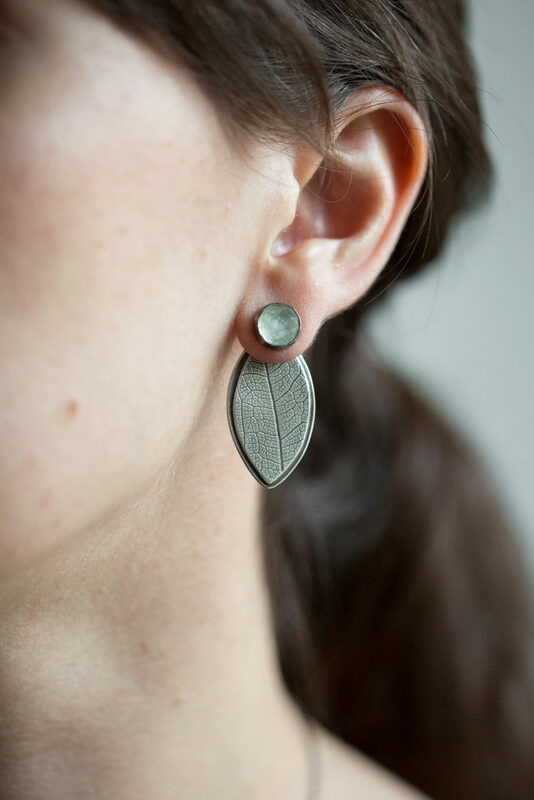 I am so pleased to finally be able to share these earrings with you! 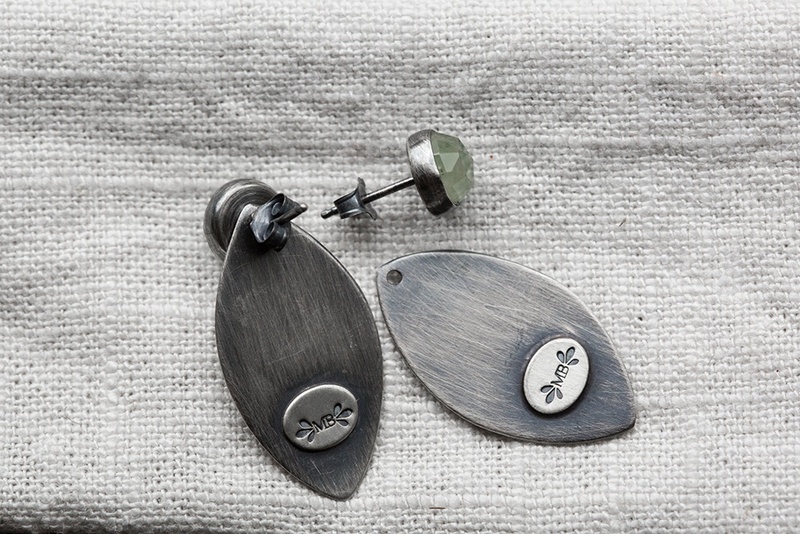 For this collection, I turned my hand to designing a pair of ear jackets. 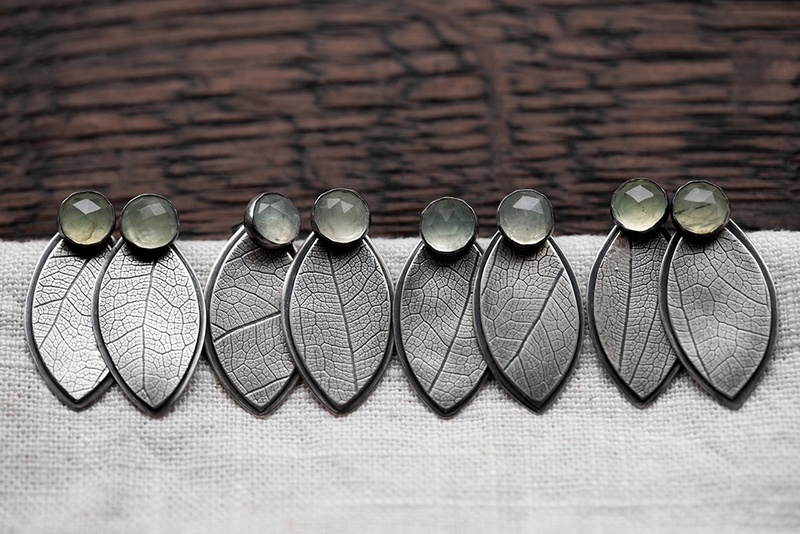 They are simple prehnite studs with loose leaves meant to be set behind the ear lobe. When I put them on and took them for a test run, I felt as though I had become part tree and had begun sprouting leaves in my hair and behind my ears. I love these so! I also made four comparatively simple rings. 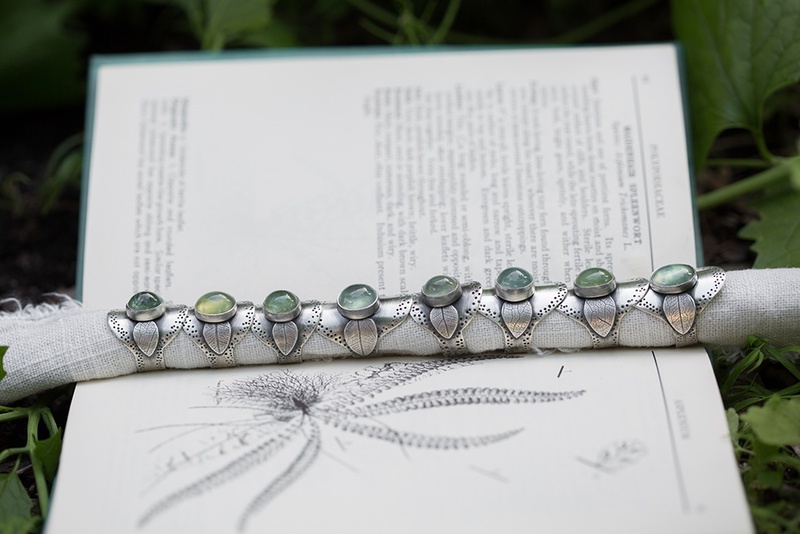 I chose four beautiful, high domed prehnite gemstones, set them in a leaf printed serrated bezel, atop a double half-round band. 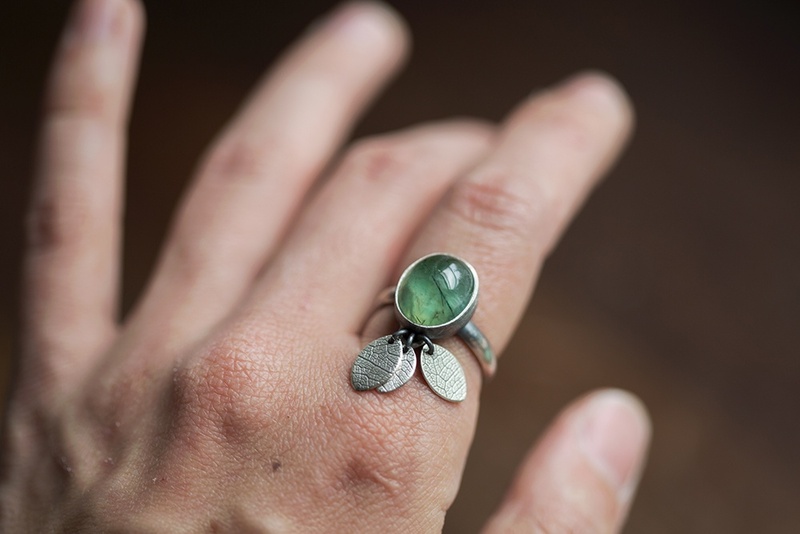 These rings are simple and unassuming. And of course, one more handful of dangle earrings. 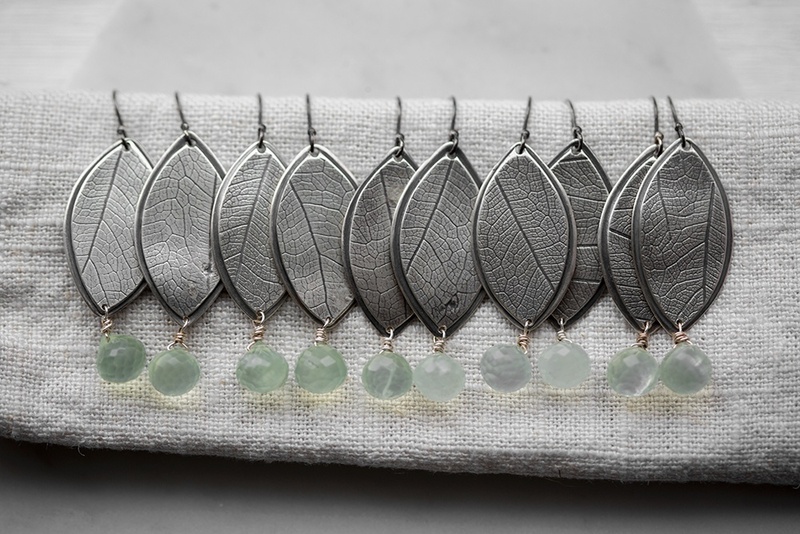 These are lovely double-layered, sterling silver leaves with single multi-faceted prehnite briolettes suspended below. 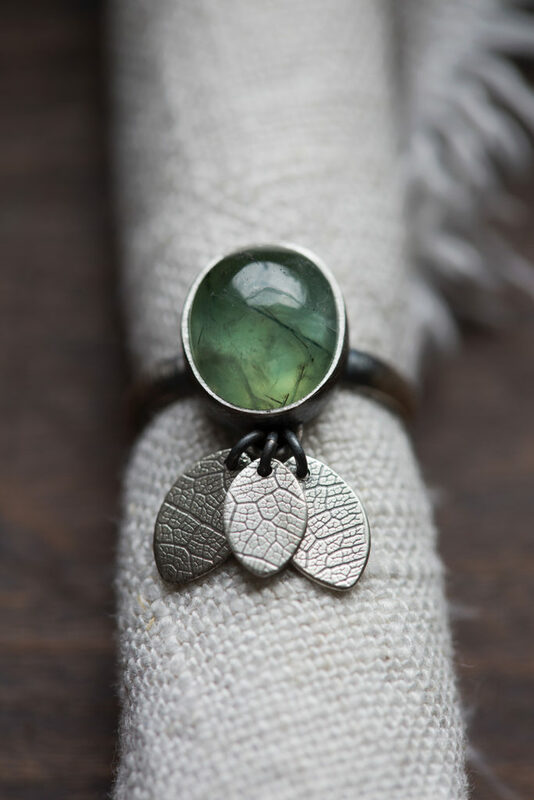 The softness of these gemstones are truly lovely. 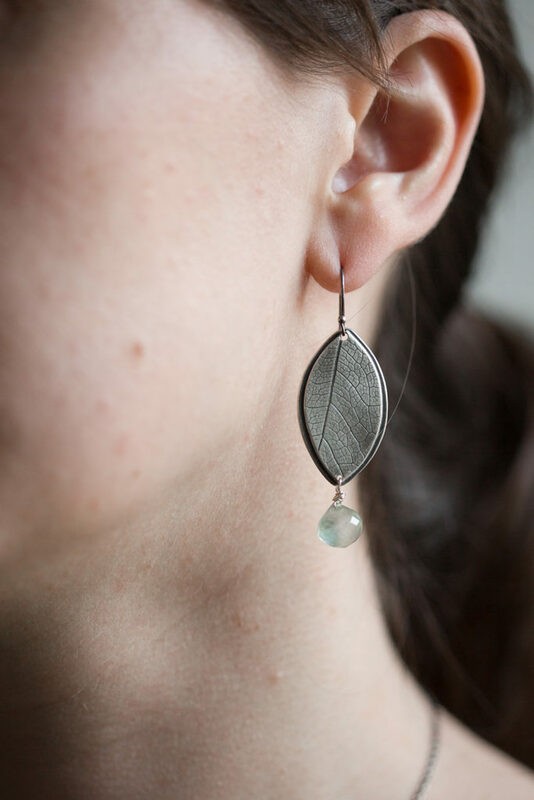 What I love most about these earrings, and really any piece that incorporates this leaf print, is how individual each impression is. Since I use real leaves for my impressions, the veining changes over the surface. You can see where little bugs had nibbled parts of the leaves and left holes. 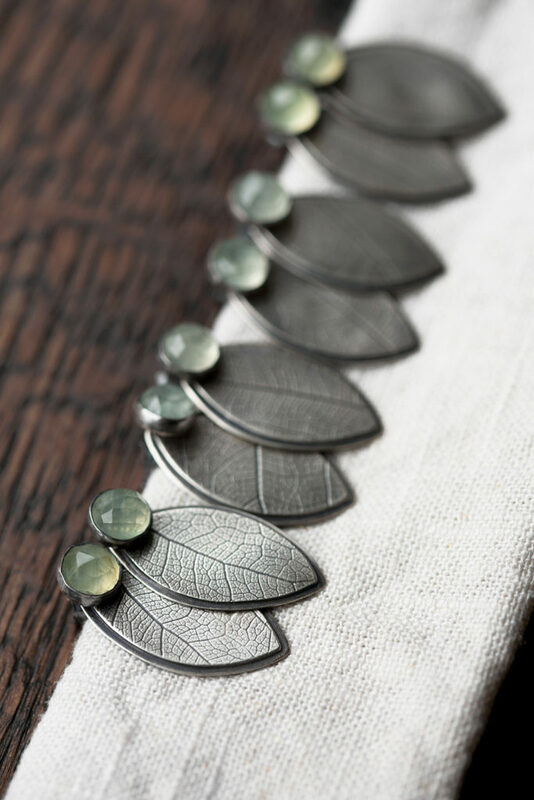 Removing the oxidization to reveal the pattern is perhaps my favorite aspect of the creation of the Mossflower pieces. 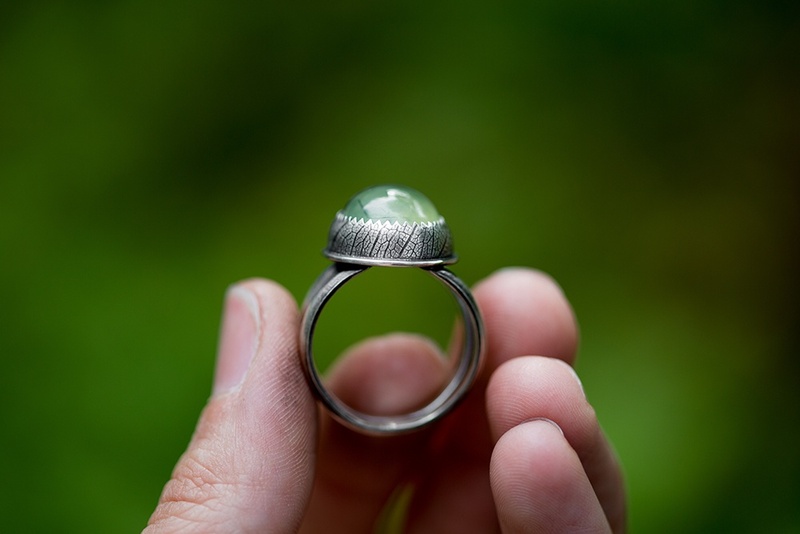 And last, but in no way least, the Glade Ring. Usually for saddle rings, I like to have a very thick shank for heft and weight. 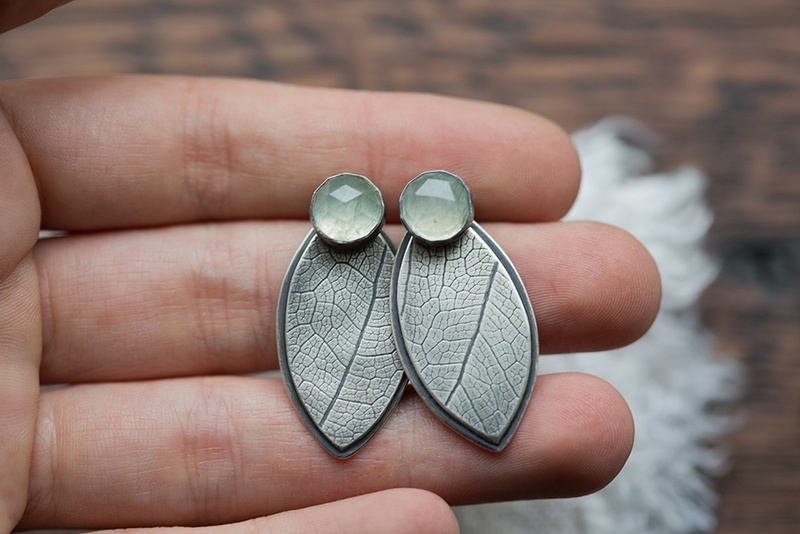 However for these, I wanted them to feel delicate, like a second skin even with the stone. 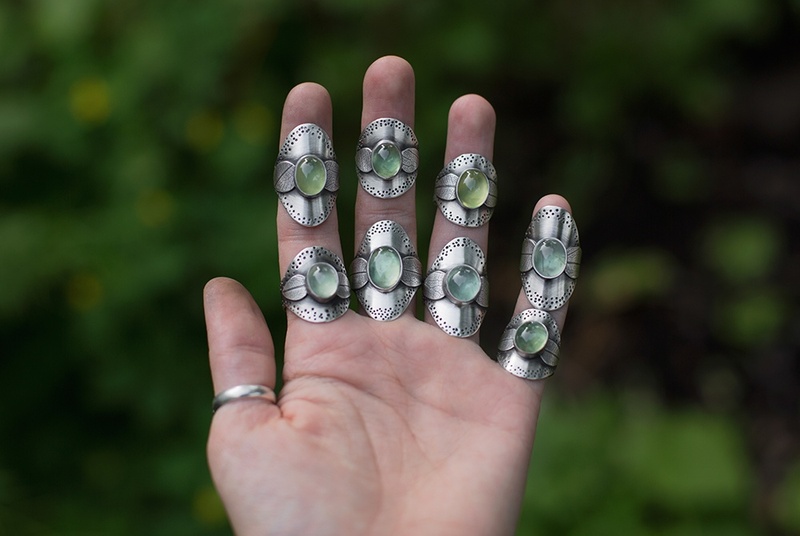 While sketching these out, I thought of a game I used to play with my sister, where we would wrap beach rose leaves around our fingers like rings, and we would pretend we were ladies of the forest. 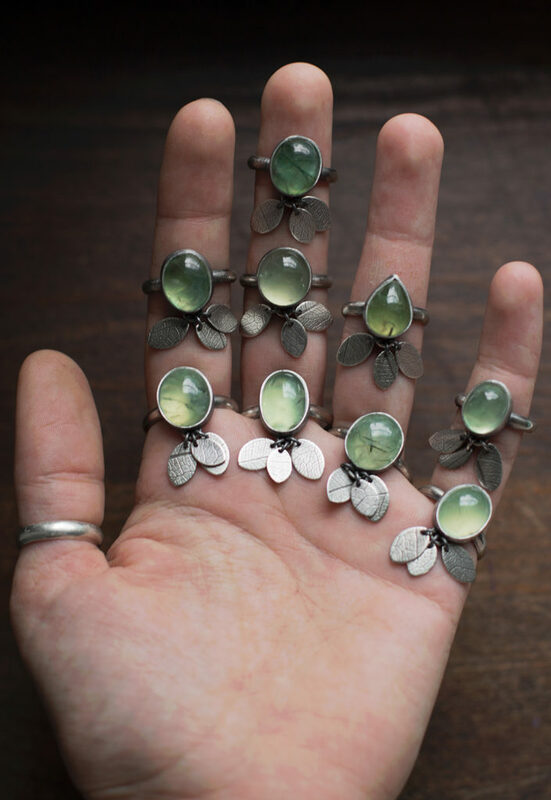 For these, I wanted to make rings that felt similar to that, light like a leaf wrapped around the finger. 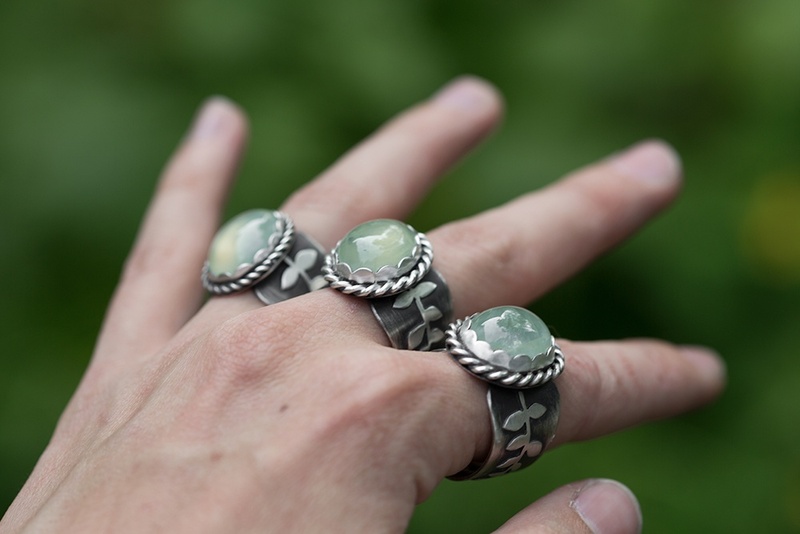 And so I used a lighter gauge of sterling silver and made them with one layer rather than two. 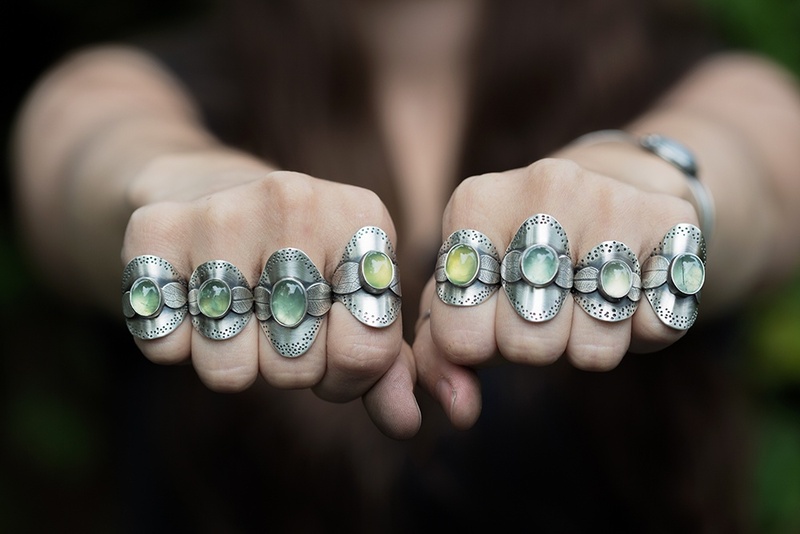 For the stones, I went through my prehnite collection and chose the softest gemstones with unique colors and feathery inclusions. 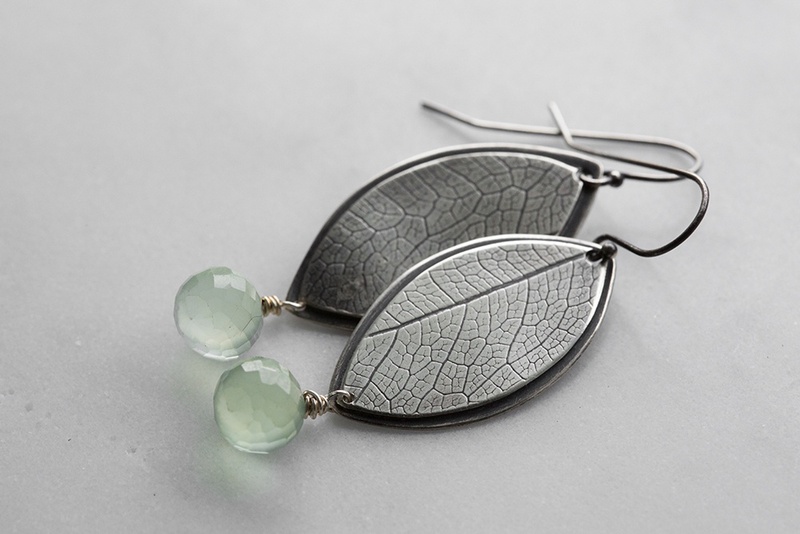 I wanted them to feel fresh and new, like a new leaf unfurling. On either sides of the stones are little leaves, splayed open to catch the sun. I wanted the ring to look organic and natural, so I created a dotted pattern around the band to look as though it has been nibbled by little insects. I made these in a range of sizes up to US 10.5, and a few of them are in petite sizes (US 4-6) for all you ladies who requested it! 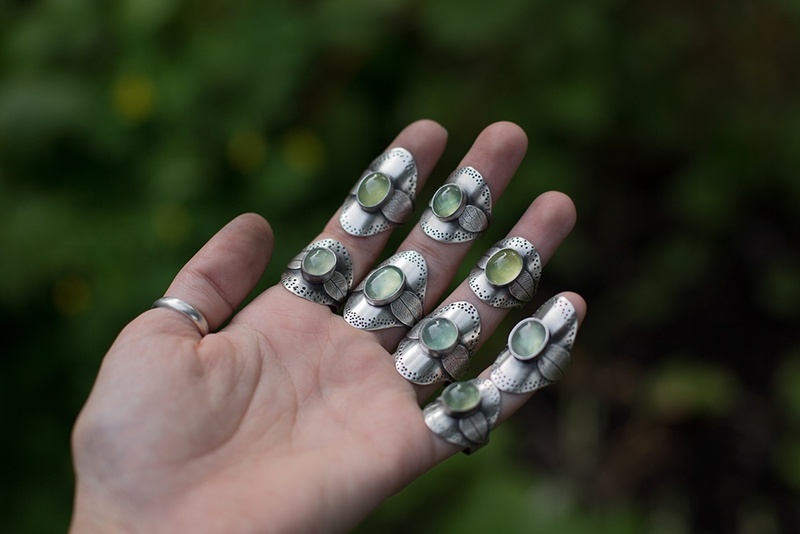 Many of my other rings are towards the larger end of the size range, but 8-year old me would be aghast if I had not made a few Glade Rings for slender hands. And so here we are! I have shown you everything that will be included in Sunday night’s shop update. I hope something spoke to you. This collection has been a joy to create, and watching it evolve has been the highlight of my spring. Many hours (we conservatively calculated in the 200’s!) were put into this offering and my hands are a bit worse for the wear, but being able to do this artistic work has been an ever-renewing blessing. Many of you have been with me for a few years, and the continued support I find is staggering and I am eternally grateful for you. And if you are new here, I hope you stick around for a long time, because I have so much to show you! 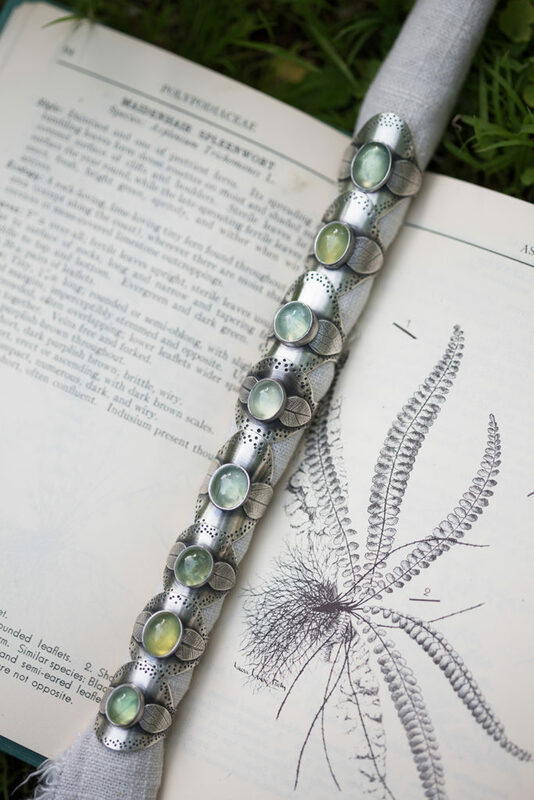 All pieces in the Mossflower Collection will be in the Etsy shop on Sunday, June 3rd at 7:00 p.m. EST. See you there, my ferns!